Jadon Sancho became the youngest Englishman to score in the Bundesliga after opening his top-flight account in Borussia Dortmund's 4-0 drubbing of top-four rivals Bayer Leverkusen on Saturday. 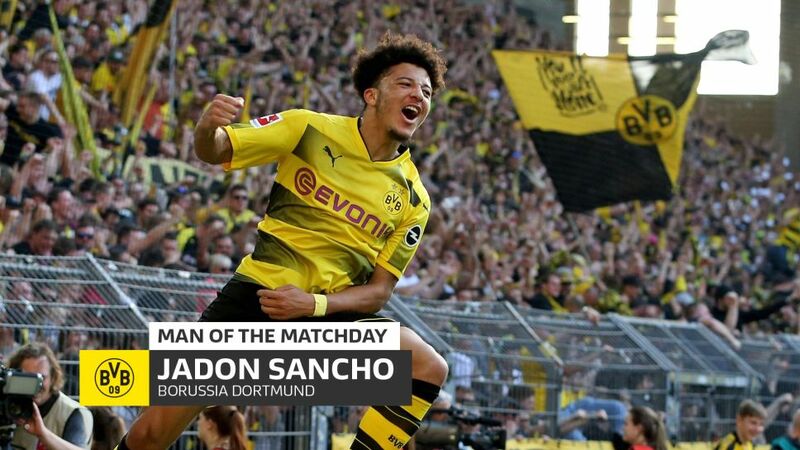 Sancho broke the deadlock in the 13th minute at the Signal Iduna Park, curling low into the bottom corner after being played clean through by USA international Christian Pulisic. The 18-year-old also produced two wonderful second-half assists for Maximilian Philipp and Marco Reus. "When I missed my first chance, I was upset with myself because it was 0-0," Sancho told bundesliga.com, having shot straight at Leverkusen goalkeeper Ramazan Özcan with the first meaningful opportunity of the game. "But I made sure I scored with the second chance. I'm really happy I scored my debut goal. "It's been hard getting back into the team, getting my fitness, but now I feel good." Sancho is the second Englishman to score in the Bundesliga this season after RB Leipzig's Ademola Lookman, and only the second since Owen Hargreaves found the net for Bayern Munich on 5 August 2005. The Londoner, who joined Dortmund from Manchester City in summer 2017, was making his ninth Bundesliga appearance and his fourth start.